People may wonder why I have chosen the same destination for my holidays in the last four years. People who know Eritrea know why. In Eritrea the people are hospitable, friendly, polite. For me it is like returning to my family and feeling at ease. It is a country not yet affected by large scale tourism. Eritrea is a social adventure. And the more you get to know the country, the more you will challenge this adventure. And of course there is the fact that my wife is Eritrean, which makes it easier, and maybe even necessary for me to socialize with her country. This year I will be on my own. No wife to accompany me, no group as a backup. Just some addresses of friends and family of my wife and her friends. And a bag full of plans. And t-shirts with the Tigrinya text "Glad to be back in Eritrea" combined with some very recognizable designs, to get the local population on my side in case of unexpected problems of whatever what nature. It worked last year and I am sure it will work this year. I only speak twenty words of Tigrinya, so the words on the t-shirt are very useful as a first greeting to whoever I will meet in the next three weeks. 50% of my 30 kilo's luggage is gifts, medicine for family of friends and letters. For the children I have a lot of small toys, pencils and business gifts. Every hole that was left in my luggage is filled with tennis balls, I received from a CMG colleagues, to hand out to the children of Asmara and an orphanage in Dekemhare that is financially supported by Child Care Afrika. And for myself (I am a work-a-holic) one kilo of plans to update my web pages and to visit as much as possible Eritrean villages. Maps, literature on Eritrea (the Bradt Travel Guide of Eritrea) and notes what to do during my stay and how to get there. I will not cycle from Asmara to Ghinda. Even my Eritrean contacts advised my not to risk my life on the narrow descent. 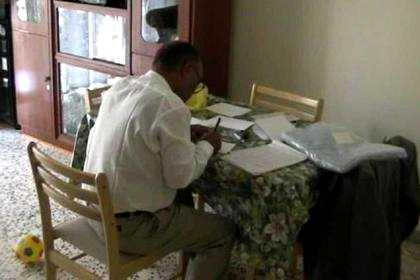 On my trip to Asmara I will accompany the mother of one of my wife's girlfriends. She is going back to Eritrea and she is is not used to large scale airports like those of Amsterdam and Frankfurt. The woman does not speak one word Dutch or English, so I just make sure she does everything I do. In the tax free shop of Schiphol I buy a bottle of whisky for Feshaye. I have to show my passport and boarding card when I pay for the whisky. Abeba's mother copies my behavior, but did not buy anything. Lots of confusion. What did this old lady do with her purchases. I explain the casher that Abeba told her to do exactly the things I do. We have to laugh. In Frankfurt, at the gate of the Lufthansa flight to Asmara, I share the feeling of the many Eritreans at the gate. We are going to have a real good time. We have to wait for a few hours. 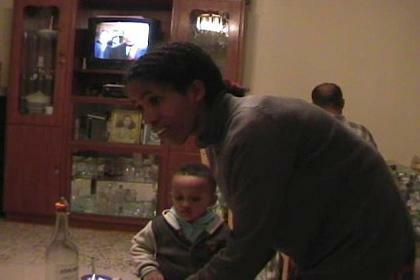 A teacher of the University of Asmara explains to me where to find the university library. "I will leave my name and telephone number in your book in case you need any assistance." After the stopover in Cairo it is only a two hours flight to Asmara. The descent of the plane stops at 8000 feet, the altitude of Asmara itself. When the plane hits the ground the passengers express their joy. We walk the 250 meters to the airport buildings, where a team of friendly but strict officials is guiding us efficiently to pass the passport and customs checkpoints. Knowing the procedures, I fill in the form to declare the video camera. The form has to stay with the camera and must be returned as part of the exit procedures. Terhas, Feshaye and their little son Hiab are waiting for me just outside the fence to take me to their apartment, two kilometers from the airport in the Sembel Residentional Complex. I will sleep in Tsega's room. She is Hiabs nanny and assists in the household. After drinking a few glasses of Asmara Zibib or "araki", the local anise liquor, we go to bed. 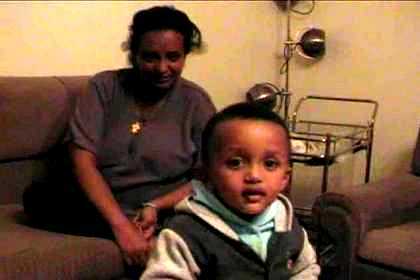 Terhas and her son Hiab in their apartment in the Sembel Residentional Complex. Tsega, assisting in the household, from now on taking care of both Hiab and me. Feshaye doing his business paperwork after his usual work.